A Laser Diode is an electronic device which produces coherent light. All the waves of the radiation are of the same phase and frequency. The radiation may be in the visible or the infrared regions of the electromagnetic spectrum. Laser Diodes find applications in burglar alarms, optical storage system such as compact discs, optical fibre communication, etc. The Laser generated by diodes is of lower power. It is portable and handy. It produces a conical beam which can be focused using convex lenses. 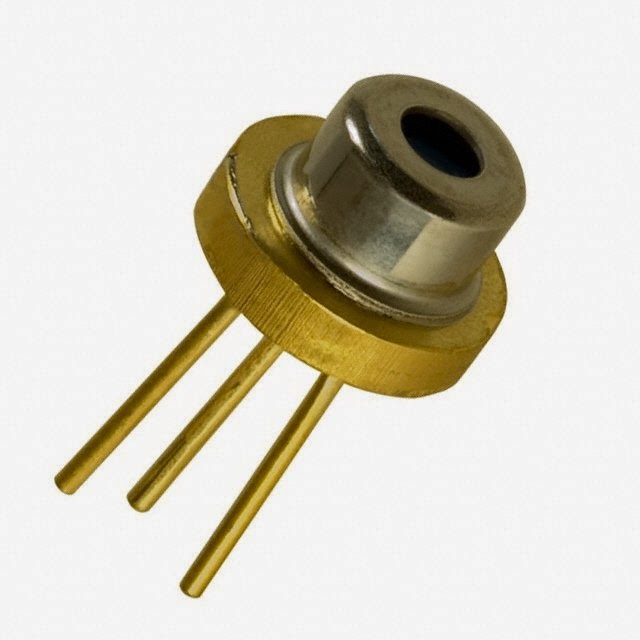 A laser diode is a P-i-N Diode in which the P type material and the N type material enclose an intrinsic semiconductor. In the P type material, the majority carriers are holes while in the N type material, the majority charge carriers are the electrons. The diode is designed such that the holes and the electrons recombine in the I region i.e. the region with the intrinsic semiconductor. When an electron and a hole recombine, they get annihilated. This results in the emission of a photon. The light thus emitted needs to be of the frequency and phase to become a laser. This is done by means of a waveguide on the crystal surface. The photons emitted will travel back and forth in the waveguide and be reflected several times. When the The light is amplified and the laser emerges. Gallium Arsenide is a material which is widely used in the construction of Laser Diodes.